This March the UCLU Green Economy Society (GES) was proud to cooperate with the German Association Club of Rome, the Global Marshall Plan Foundation, FÖS, DNW and FAW/n in organising the very first UK Conference Day on Sustainability. Such student led Conference Days have already been conducted in a number of German, Austrian and Swiss universities. The GES is therefore very proud to have contributed to the international expansion of this thought-provoking initiative. 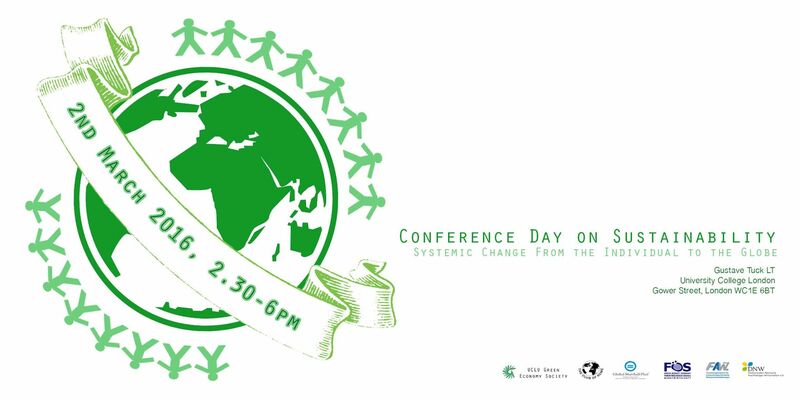 As part of the theme ‘Systemic Change – From the Individual to the Globe’ the Conference Day was aimed to create a holistic picture of multi-level systemic sustainability related change. Next to more general introductory and conclusion speeches, the diverse individual speakers addressed the challenges and opportunities of fostering sustainability in individual behaviour; transitions towards sustainability on small and large-scale firm levels; as well as the efforts to foster systemic change on a multi-national level. The different perspectives on systemic change were then combined as part of a collective panel discussion led by a UCL lecturer. Throughout the breaks conference participants had the chance to mutually exchange their thoughts on the matter. Further breaks could be used to check out the exhibit of the UCL Sustainability Challenges, consisting of student project proposals on how to generate a more sustainable UCL campus. Towards the end of the conference the winners of the challenge were announced. The conference commenced with an opening speech by Professor Raimund Bleischwitz, an influential environmental policy adviser from UCL’s Sustainable Resources department. In his introductory speech Raimund not only informed our guests about the procedures of the afternoon and the Conference Day Initiative in general, but also linked them to the overall themes of systemic change. As part of this he addressed the importance and challenge to stay within a 2C+ global warming limit and to tap into the full potential of the Sustainable Development Goals. Further he talked about the exciting developments of eco-innovations and circular economy, as well as the importance that students across the globe reflect on and challenge the barriers to great transformations towards sustainability. psychological effects on UCL students and staff – hindering individual change towards more sustainable behaviour. The talk emphasised the intricate psychological influences that can foster or prevent individual sustainability related change. Universities and other institutions are not free from responsibility but play a significant part in encouraging orpreventing behavioural change. Following Beth’s presentation on individual sustainable behaviour, our next speaker Louise Green, the head of Neal’s Yard Remedies’ sustainability team, introduced a new perspective: Challenges of systemic sustainability related change on the small and medium sized firm level. Neal’s Yard Remedies is a Carbon Neutral Company that won several prizes, such as the ‘Best Offset Retailer’ Award four times in a row from 2011-2014. Louise introduced the audience to the challenges behind the firms sustainable success, ranging from tensions with other company departments, challenges inherent to generating a sustainable supply-chain and appropriate sustainability reporting, to trade-offs between green and social benefits of organic and sustainable labelling. Here it was interesting to hear about the multifarious challenges that occur throughout a businesses’ pursuit to greater sustainability. After a short break Caroline Ruter from GlaxoSmithKline (GSK) continued with her contribution to the conference. Caroline introduced the perspective of a large-scale corporation in regard to sustainability related systemic change. Next to her general introduction to the company, Caroline talked about some of the sustainability initiatives the GSK has implemented to date, which largely focus on a reduction of the company’s water and carbon footprints. Other than that Caroline reported on GSK’s interesting Supplier Exchange initiative. This initiative allows the company’s over 500 suppliers (dispersed across 44 countries) to exchange best practices in regard to sustainable production and further encourages greater sustainability through, amongst others, Supplier Environmental Sustainability Awards. Although the sustainability endeavours of particular large-scale corporations are at times publicly disputed, Caroline’s talk informed the audience of the important roles such corporations can play in fostering greater sustainability. Our final individual speaker was Camilla Toulmin, the former director and now senior fellow at the International Institute for Environment and Development (IIED) and renown economist. Camilla introduced the final viewpoint by reflecting upon systematic sustainability related change from a multi-national organisational perspective. She talked about her past experiences at the IIED, an institute that emphasises the need for multi-level action combined with an evidence-based approach. In particular Camilla addressed the significance of partnerships, institutional self-reflection/learning, as well as the need to include and strengthen various different voices and perspectives in pursuit towards a fairer and more sustainable world. Overall Camilla made a convincing case for the necessity of mutual exchange between bottom-up and top-down initiatives, for the expertise of local and indigenous knowledge and for the diversity of successful and possible approaches towards greater sustainability. After another break the different perspectives addressed in the individual presentations were combined as part of a collective panel discussion led by Dr Sam Randalls (a UCL lecturer from the Geography department). The panel brought together all previous presenters to convene and exchanged thoughts on what has been discussed so far. Throughout, the audience had the chance to contribute their thoughts and ask questions. This was a nice way to combine the different perspectives in regard to systematic change, including the perspectives and questions from the audience. Fitting to the theme and ensuing the panel discussion the Conference served as a platform to present the final project proposals of the UCL Sustainability Challenge and to announce the challenge’s winner. The challenge asked students to devise individual project proposals on how to make the UCL campus more sustainable. The precise challenge was to ‘Develop an intervention, project or strategy to allow students to tap into the expertise of UCL academics to shape their sustainability campaigns, advocacy or social enterprises.’ Alex Green from the UCL Sustainability Team announced the proud winner: Anna Hands. Anna set out an ambitious proposal for ‘GreenConnect’, a well thought through engagement network to foster mutual exchange between students and academics at UCL. The runner up price was given to Nathaniel Greenwold who pitched a proposal for a Youtube Channel through which to showcase UCL’s cutting-edge sustainability research. The UCLU GES and UCL Sustainability Team are thrilled to have both of these project proposals realised at UCL throughout the coming term. The conference ended with a wholistic round-up talk by the renown Professor Paul Ekins, director of UCL’s Sustainable Resources department. Paul nicely wrapped up what was discussed throughout the conference and similar to Raimund in the introductory speech linked it to the wider themes of systemic change. He addressed the importance of multi-level change, which was extensively covered throughout the conference, i.e. change on the individual, small – and large-scale firm level, as well as on the multinational, organisation and legislative level. Aligned with the overall theme of the conference, Paul emphasised that only when these different (throughout the conference reflected upon) levels interact can we successfully tackle the great challenge of systemic change towards a more sustainable society. Looking back to this great event, the UCLU Green Economy Society wants to thank all of the excellent speakers for this very successful and enriching Conference Day on Sustainability entitled ‘Systemic Change: From the Individual to the Globe’. Further, the Society wants to thank the German Association Club of Rome, the Global Marshall Plan Foundation, FÖS, DNW and FAW/n for its support throughout the organisation process. Hopefully this UK Conference Day on Sustainability marked the beginning of many future UK Conference Days to come.